Blind Cricket is not that different to the game you see on television and in the parks throughout the summer today. The team is made up of a mixture of vision impaired and totally blind players. The ball is bowled under arm. The ball must bounce at least twice before reaching the batsmen. Batsmen may be restricted in the time they can spend at the crease. A totally blind bowler uses a caller behind the stumps whilst bowling. Apart from these minor alterations to the rules, the game of Blind Cricket is very similar to the game we all know. This ball is made from a hard plastic compound with small holes around it so sound may be emitted from the metal washers and bottle tops that are inserted during manufacture. 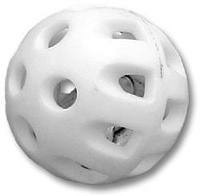 This ball is a white colour and therefore the game is better played on a synthetic or turf wicket. A minimum of 7 players per team is required for match to commence. Note:- A player with for example 2/60 vision sees at 2 metres what a fully sighted person sees at 60 metres. During a batting innings there are batsmen at either end. When a batsman has scored 40 runs (40 over match) they are required to retire. If a batsman exceeds 40 runs by scoring a 4 or 6, this will count towards the batsman score. If there are overs remaining at the end of the innings the retired batsman are allowed to return to the crease in the order they batted. When a B1 batsman is on strike for the first run off the bat the fielders can only run out the runner attempting a run to the non-striker´s end. If then the batsmen are attempting a second or more runs, the fielders may then attempt to run out either batsman at either end. When a B2 or B3 batsman is on strike, the fielders may run out the batsman at either end. When a batsman is on strike either runner is permitted to call. When a B1 batsman is batting, another B1 player only may stump them. A B1 Batsman must remain in the crease until the bowler calls play. The batting line up must be rotated between the three categories before the next player in that category may bat. The rotation order will depend on the number of players available in each category. A bowler is permitted to bowl a maximum of 20% of the overs available in an innings. Example: A forty over match, a bowler may bowl a maximum of eight overs. A B1 fielder may catch the ball after one bounce to dismiss a batsman. During an innings byes, leg byes and over throws will be counted. The nominated wicket keeper is permitted to bowl and a nominated alternative wicket keeper can replace that person. At the end of each over the fielding team must bowl from the alternate end. Wicket keepers must remain in a standing or crouching position until the bowler has called play. This means a wicket keeper cannot be on their knees until the bowler calls play. Each innings shall consist of a maximum forty overs. The number of overs may be reduced depending on time allowed. B1 bowlers must bowl forty percent of the overs to be bowled. Example: In a forty over match, B1 bowlers must bowl sixteen overs. If a fielding team fails to bowl their required number of B1 overs, the fielding team will be penalised by the addition of runs to the batting teams score. The penalty is calculated by multiplying the batting teams run rate by the number of remaining B1 overs. If in either innings the bowling team fails to complete the required number of overs to be bowled in the allotted time. The team bowling is deducted a quarter of a point after 10 minutes has lapsed after the due completion time and then deducted a quarter of a point for every 10 minutes or part thereof required to complete the remaining overs. The additional time taken to complete the first innings will be deducted from the change of innings break. This does not count if the team batting first is dismissed in less than the allotted time or overs. New players are most welcome to come and try this great game! Players have to be eligible to participate in the competition. 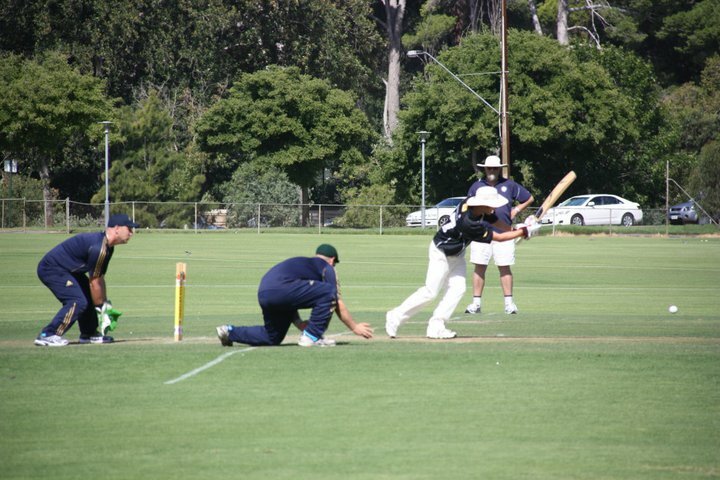 The Victorian Blind Cricket Association is always looking for volunteers to assist and support the competition. Volunteering is easy and training is provided to ensure all volunteers are comfortable and have a rich and rewarding experience! Go to the Victorian Blind Cricket Association website to contact the hard working committee and see how you could be a part of developing this great game in Victoria.